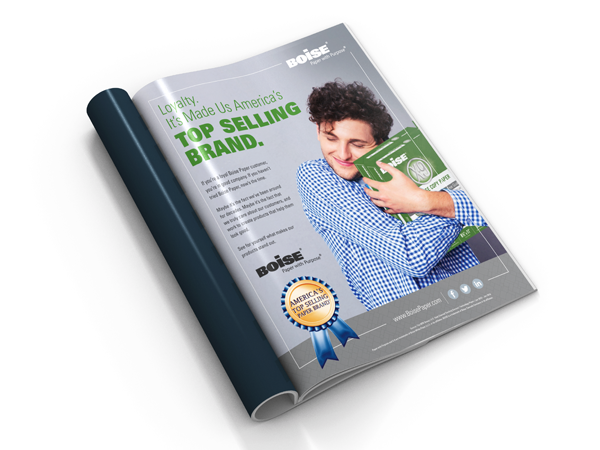 For this ad, Boise Papers wanted to spread the word about being America’s top-selling paper brand, and entrusted Evoke Idea Group with crafting that important messaging and imagery. Evoke delivered by selecting an image that instantly conveys what Boise’s audience needs to know – people love their papers. Simple and direct, the messaging supports the image by emphasizing customer loyalty and makes potential customers want to see what all the fuss about Boise is all about.